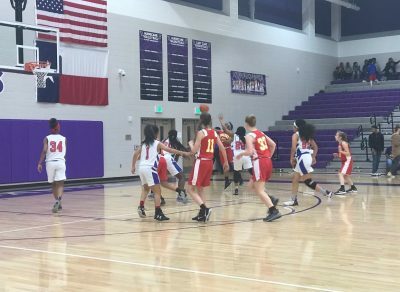 On Jan. 10, 2019, Klein Cain Basketball hosted the 8th-grade girl’s basketball game between Ulrich and Doerre. Two games that took place, with B-team at 5:30 p.m and A-team at 7 p.m. Coaches Jennifer Medina coached the Doerre team and Brittany Simmons coached the Ulrich team. “I knew I wanted to be a coach since college. I played basketball and other sports since childhood and love them. When I took my first education class in college, I knew being a teacher and a coach was for me. I truly enjoy and value teaching and coaching young people and helping them be successful on and off the court or field,” Medina said. Doerre won the first game (15-18). At the end of the game, they lined up, gave high fives, and said “good game” to the opposing team. The second game was won by Ulrich (35-31). By the end, the scores were flip-flopping and tying with coaches yelling at the teams. In addition, each game for intermediate schools usually lasts for an hour and a half with four quarters and eight minutes per quarter. “My basketball team has improved greatly during the course of this basketball season. We still have things we need to work on such as shooting and defense, but I am very proud of how they are doing and very proud to be their coach,” Medina said.